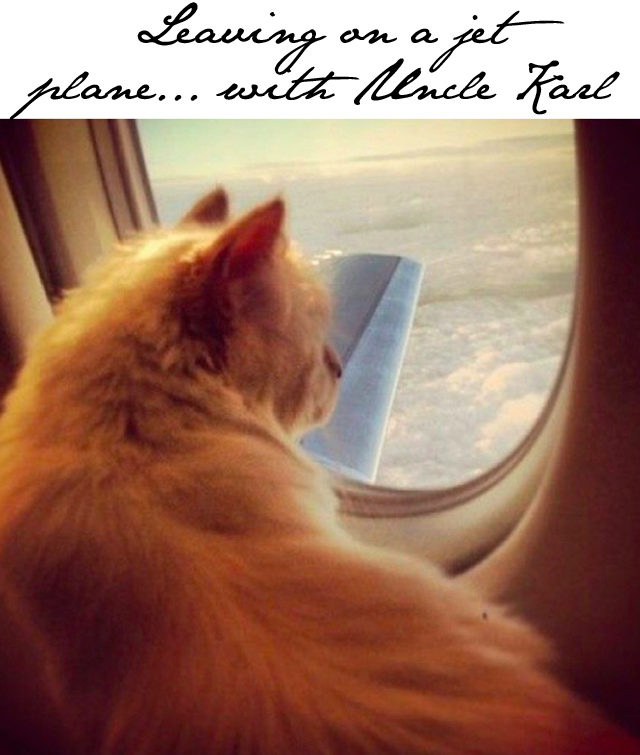 Karl Lagerfeld's cat Choupette flies by private jet plane, naturally. Choupette might just be the most spoiled kitty cat in fashion. But, then again not everyone can say their papa is Karl Lagerfeld. For those of you that haven't been keeping track of Karl Lagerfeld's cat Choupette, allow us a minute to fill you in. Choupette, as we've just mentioned, is Karl Lagerfeld's cat. Naturally, as the daughter of Karl Lagerfeld, you are afforded certain privileges in life that most cats only dream of. For example, Choupette has two maids, a driver and 24 hour medical attention. She is brushed twice daily - hello, diva. Oh, and she travels by private jet. The private jet part of Choupette's lifestyle is a new revelation and one that was brought into clear focus thanks to the cat's instagram account this evening. Choupette writes, "I'm leaving on a (private) jet plane, don't know when I'll be back again...." Oh, you clever kitty. You actually have humans jealous of your cat-couture existence!